At Relevate, we focus on deeply challenging the body with proper form and alignment in mind. Classes are all-levels and balanced to ensure you receive both the deep muscle burn and sweet restoration that we all crave. Small class sizes ensure that you receive personalized attention and encouragement. You will sweat, shake, and push your limits! The magic of Relevate is rooted in our uplifting and empowering self-love philosophy. In every class, you are encouraged to listen to the your body's wisdom and to take breaks or the offered modifications as needed. Relevate teaches you how to modify the intensity of your workout based on your energy level, so you get the workout YOU need every single time. We love rebels and rule-breakers, and teach you how to powerfully and unapologetically do and be YOU. Are you a Pilates lover too? Be sure to check out our Pilates Reformer classes! 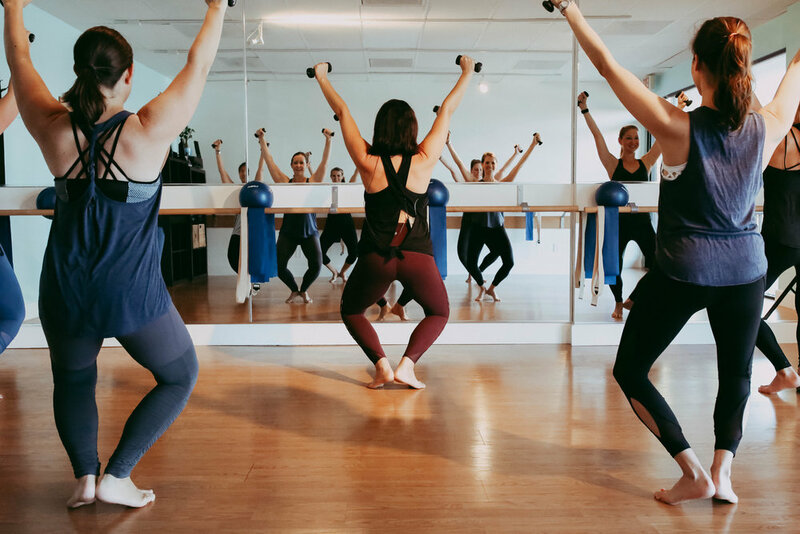 Our signature Relevate class is a 60 min turbocharged barre sculpt workout that weaves together yoga, Pilates, heart-pumping cardio, and functional strength training to strengthen and lengthen your muscles. We finish every class with 10 min deep, restorative stretching to balance the body and calm the mind. Just like our signature class experience, except in a 45 min express format. Think faster pace, buckets of sweat, and a full-body burn in less time - we turn up the HEAT in this class. Perfect for those who want to supercharge their energy and strengthen their body, but who are also busy and on-the-go! *NEW April 2019* Relevate + Restore (60 min) blends 30 min of our favorite Relevate Barre burn with 30 min of Yin/Restorative Yoga and a deliciously long savasana with guided meditation. You will leave feeling uplifted, renewed, and restored! Offered on the first Saturday of the month (90 min), Relevate + Reiki combines 45 min of our signature Relevate experience with 45 min of deep restoration through Yin and Restorative Yoga, and hands-on Reiki energy healing. It’s the perfect way to start your weekend AND your month. There is nothing out there like Relevate, so check our schedule, grab one of our New Client Deals, and come MOVE with us!